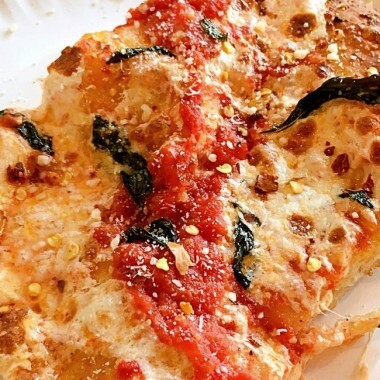 The best new pizzeria in New York is Corner Slice at Gotham West Market. The best new pizzeria in New York does not command a two-hour wait in the West Village. It does not take advance bookings via a mobile app. It does not sell limited availability burgers . It does not decorate its space with magnums of Krug Champagne. It does not have a credit card-only policy: That crumpled up five-dollar bill in your pocket is good here for a meal. There are cheese and soppressata slices, but the tomato slice is nearly unparalleled. Take a whiff of roasted garlic and sweet Sicilian oregano as a tray of pizza comes out of the oven. Tomatoes, both canned from California, and fresh ones from Jersey, striate the bread in gorgeous shades of pink, orange, and red. Most bites are pulpy and electrically acidic. Others — where the layering of the fruit is thinner than a coat of paint — are drier and more aromatic. The exceedingly light slice, about half the weight of a deck of cards, eats in about 30 seconds.